Forget your idea of concrete as plain vanilla. These days, concrete hardscapes can be just as beautiful as hardscapes created with other materials. In fact, you'd be hard pressed to find any differences. The biggest difference? Concrete is cheaper. Duval Paving, LLC can make your concrete hardscape look anything but plain. Duval Paving, LLC uses a variety of techniques to achieve a concrete surface that is as decorative as it is functional. But if plain is what you want, we can do that too. We've been in the concrete business since 2011. No one will ever know it's concrete. With a custom concrete application, Duval Paving, LLC can make any concrete surface look like a million bucks. In fact, with stamped concrete, your driveway can look like it was paved with gold. Stamped concrete is a decorative application that is created by imprinting patterns into the concrete surface as it sets. Stamped concrete is a great way to achieve the look of cobblestone, brick, natural stone, and even polished marble. Duval Paving, LLC has been in the paving business for 8 years, making concrete surfaces look great. Duval Paving, LLC works closely with clients to design and create a unique concrete hardscape. Using a variety of concrete applications, we can customize your surface with the look of more expensive building materials. Concrete can be colorized, texturized, or stamped or imprinted to achieve the look you want without breaking the bank. All of our customized concrete is sealed to protect and enhance the surface. We use polymerized sealers and non-slip finishes for maximum durability. Once your decorative concrete hardscape is installed, it only requires a sealer coat every couple of years. 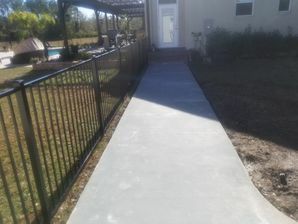 Duval Paving, LLC also provides non-decorative concrete installations for driveways, sidewalks, walkways, and patios. Call (904) 201-2161 to discuss your concrete surfacing needs. We'll help you choose the right concrete installation for your job. Duval Paving, LLC has been in the paving business since 2011, specializing in functional and decorative concrete surfacing. Whether you're looking to pave a residential or commercial hardscape area, the concrete experts at Duval Paving, LLC will make sure that your project is handled professionally from start to finish.